PICKER aircraft tugs and tow bars including manual aircraft tugs,is a family owned aviation product design company headquartered in Flushing Michigan at Flushing's Dalton Airport (3DA). One of the leading aircraft tug manufacturers, the company is owned and operated by Jeffrey Irwin. The company specializes in the systemic engineering, design and manufacturing of aircraft ground support equipment (or GSE). IRWIN has a 35 year history engineering tools. These products are premium built, powder coated quality hangar tools. They are very proud that they can say the PICKER's airplane tugs and aircraft towbars are made and manufactured solely in the USA and can be shipped anywhere in the world. 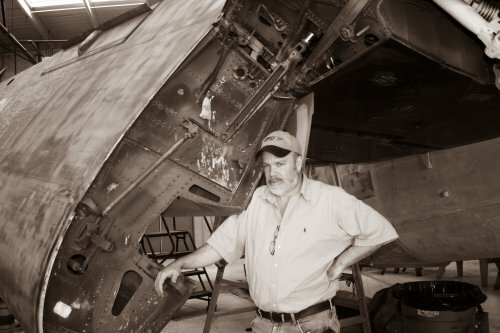 The IRWIN family members associated with the aviation side of the company cover literally decades of aircraft ground support product design & manufacturing stemming from actual FAA certified commercial and private pilots. PICKER's Aircraft Towbars and Tugs- in general greatly aid people in General Aviation to move and transport aircraft in and out of hangars and across the air field. The continous growth of quality GSE products is 100% family based and very rich with generations and decades of Aviation Heritage dating back to the early 70's. Think of it like this... The tail wheel tow bar dolly fits " all " of the sometimes tricky Van's RV tail draggers, also J3-Cubs thru 450 Stearman's, that's a whole lot of aircraft. The PICKER’s can even be quickly dialed-in "by hand using NO tools” most of the time and with a wrench for a more permanent setting. You can even change the “Location” of the tail wheel in the dolly anywhere from the axle for more leverage or more lift depending on your needs. IMPORTANT !! - Special steel collars are used to dial in the 'WIDTH" of your tail wheel so that it won't flip sideways and fall out. This is very likely one of the simplest most universal tow-bars with wheels on the market. The Fact is - this new towbar design to date has fit every tail wheel they have tried it on. Also to date they've had “zero” returns, they have heard from and contacted many customers and they all say they are satisfied. You may even get a random call from the owners checking to hear about your experience, they want to make sure you've had a good experience. They enjoy uploading customer’s pictures onto the website so feel free to email a few pics to us using the PICKER on your aircraft. The Irwin family engineered and patented the original "Lift Pin" concept December 10th 1991 and was since revered as "Best Tow Bar Design" multiple times by the "Aviation Consumer" and base on adaptability and performance the PICKER's are even better. The Irwin's family manufacturing team is well intact and been designing and making tugs and tow bars now for 30 years running, but now the name is PICKER and they're Powder Coated bright yellow. They can honestly say that more exclusive patent pending uniquely engineered designs are coming. Product models are usually identified with an aviation/aerospace styled dash number like (-1). Currently the number one in the -1 design represents the lifting Picker-Pins being located on (((1 side))) of the tow bar. The -2 design represents lifting Picker-Pins located on ((( 2 sides ))) of the towbar. As usual, the IRWIN family tradition has been confirmed again as their PICKER airplane tug and aircraft dragger products sell very well and stand very tall against current competitors when it comes to price, user options, adaptability, performance and overall customer happiness.